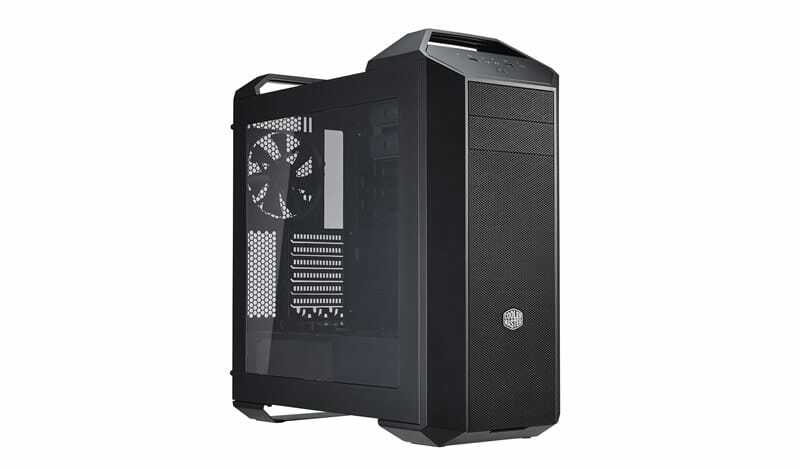 Although the MasterCase 5 externally looks like just a tower case, Cooler Master is actually taking a huge bet with this product. This is their first case featuring the “FreeForm Modular System”. Much like its name suggests, the company’s aspiration is to make this the first truly modular case ever. Some extra parts and accessories were released alongside with the case but Cooler Master claims that many more are going to follow. We are having a thorough look at this new, unique design and some of its available extra accessories in this review. The bundle of the MasterCase 5 is very simple and straightforward. Still, it comes well presented in a compartmentalized small cardboard box. The bundle consists of a basic manual, an extra mounting bracket for a fan, several simple black cable ties, two black Molex to 3-pin fan adapters and the necessary mounting screws and hardware. With the exception of the motherboard’s standoffs, all of the screws are black. The modular nature of the MasterCase 5 is supposed to allow upgrades and changes. Some of them are offered in the form of aftermarket accessories that can be purchased separately when needed. There are only a few accessories available right now but, we are told, more will become available in the future as the “modular case” trend picks up. Cooler Master supplied us with all of the accessories currently available for the MasterCase 5 and we are having a quick look through them. The most basic accessory is that of an extra 2.5″ drive bracket. Two come with the case, but the MasterCase 5 actually has four 2.5″ bracket slots (two in the system area, two at the rear of the motherboard tray). Cooler Master offers extra brackets for those that want to populate more than two of these slots. 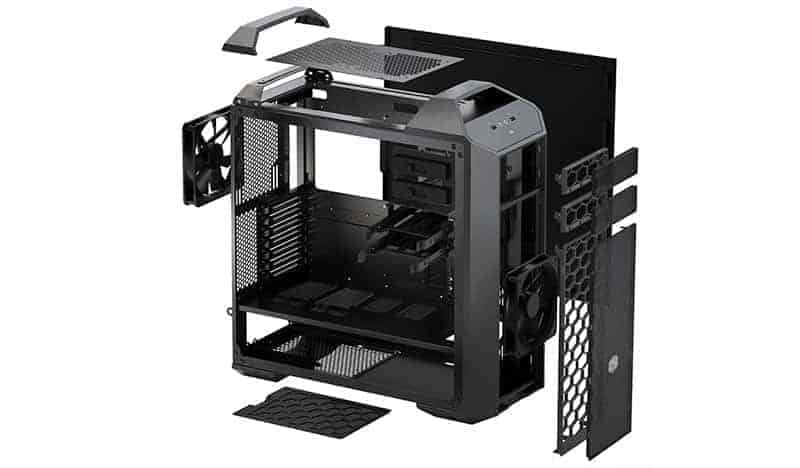 Perhaps the most obvious accessory for such a case would be the extra HDD/SSD drive cages. Cooler Master offers them in two variants, one for two drives and one for three drives. They come complete with their drive trays and extra mounting screws. The trays can hold either 3.5″ or 2.5″ devices. The windowed side panel is just what its name suggests – a windowed right side panel for those that would like to display their system. The black stripe that covers the PSU compartment area can be removed if desired. The MasterCase 5 is a modern design, based on simple shapes and geometric patterns. 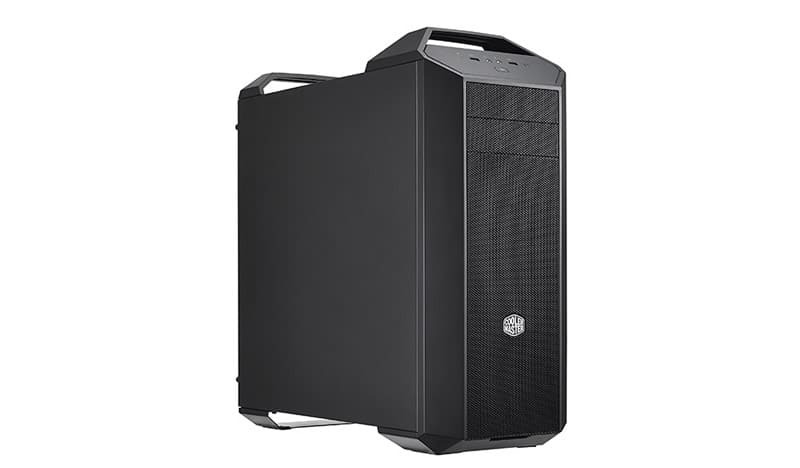 It appears based on the first Cooler Master Scout case, but it is more serious and elegant. The entirely of the case, metal and plastic parts alike, is sprayed with a satin black paint. Cooler Master did a fine job making sure that the paint is not significantly different between the plastic and metallic parts, creating a uniform, quality look. With a volume of 0.0659 m3 (65.9 liters), it is neither a small or large case as far as Midi-ATX towers are concerned, but do note that it is 23.5 cm (9.25″) wide, which is significantly wider than typical ATX designs. It also tipped our scale at 10.4 kg, making it a fairly heavy case for the size. 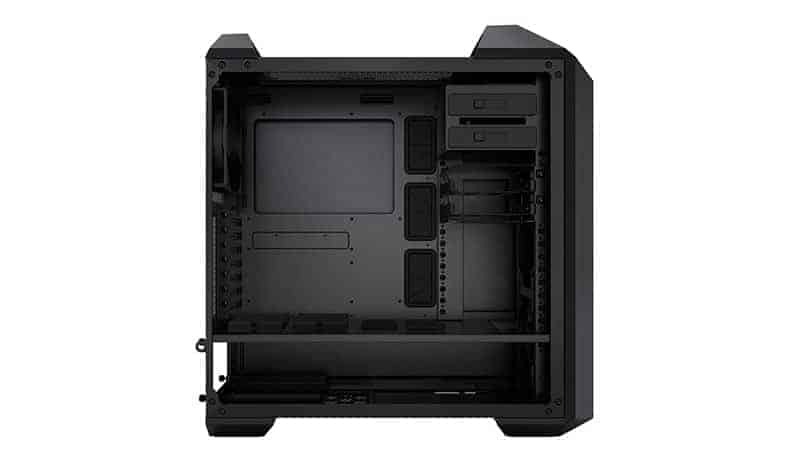 The stock version of the MasterCase 5 has no windowed side panel, only the MasterCase Pro 5 does, but it is offered as an extra accessory. If purchased an installed, by default it will still be hiding the lowermost part of the case, where the PSU compartment is. If the system is very tidy, the black stripe hiding the PSU compartment can be removed, displaying the entirety of the system. Cooler Master placed the front I/O ports and buttons at the top front of the case, on a tilted surface. Given that the case is rather tall, the position of the buttons and I/O ports clearly favors placement under a desk and makes the use of a windowed side panel questionable. The power-on button rests at the middle of the formation, with the 3.5 mm audio jacks above it and one 3.0 USB port on either side of them. A tiny square reset button can be seen to the right and a small HDD activity LED to the left. The two handles at the top of the case appear to be plastic. Actually, their covers are plastic and the main frame of the handle is steel, directly attached to the main frame of the case too. They can easily handle the weight of the case and any system that may be installed inside it. Removing the four large screws releases the metallic top cover of the case. The screw heads are very visually intrusive and made us wonder if the designer has never heard of countersunk screws. A simple nylon filter is placed beneath it; do not expect it to keep out too much dust. Two 120/140 mm fans can be installed on the metallic cover. Cooler Master offers the top frame and cover of the MasterCase Pro 5 as an extra accessory for the MasterCase 5. It comes with the metallic frame that can fit two 120/140 mm fans, providing enough clearance for a liquid cooling radiator. Arguably, the MasterCase 5 looks much better with the extra top cover installed. The top cover does not block the handles and converts the area beneath the front handle into a simple storage department. The rear of the MasterCase 5 reveals the position of the PSU compartment at the bottom of the case but is otherwise uninteresting for a modern design. There are no grommets or holes for custom liquid cooling solutions. A nylon filter is placed beneath the PSU fan intake and it can be removed by pulling it out towards the rear of the case. At the bottom of the case, the feet resemble the handles found at the top of the case. They too are made of steel and attached to the main frame of the case, with plastic covers over them. The only difference is the long rubber feet on them that, strangely, appear somewhat worn on our brand-new sample.